I just finished a new educational trading video on crude oil. This short video shows you all the Q3 trading signals that took place in this market. The results have been nothing short of spectacular. With gains of over $20,750 per contract, I think you'll understand why we are so excited about our "Trade Triangle" technology and this video. During the Q3 period we had six trades; four winners and two losers. The biggest gain was $13,160 a contract, while the biggest loss was $3,770. Q3 was a great quarter that produced fabulous results. While our Q3 results were great, what is more impressive is our "Trade Triangle" approach has consistently produced positive gains for the past five quarters. With gains of $88,450.00 per contract over that last five quarters, you can see why we believe we have the perfect balanced approach to this market. That's what we are most proud of. Pingback: Mover Mike » The video that proves it all. Thanks for everything Adam. Learning your system has brought me a better quality of life by keeping emotion out of it. Does the Trading Triangles program provide trade alert for the various stocks and futures the trader is trading. For instance, the trader is tracking JNJ or Jan 09 Crude Oil. Would the program provide instant alerts via email or messenger every time one of the various Trade Triangles triggered? I enjoy the trading videos! 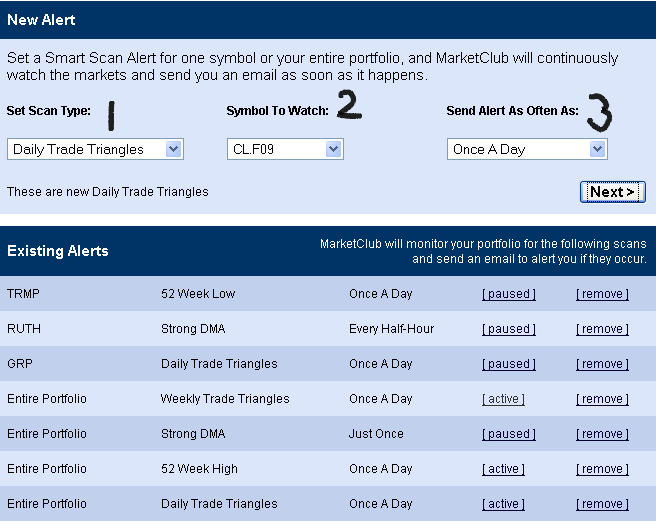 When you are a MarketClub member you can set alerts for any symbol that you place into your portfolio. The alerts you set can ask our processor to ask for all types of things: new breakouts, price % change, new high/lows, and yes, even new "Trade Triangle." Since we suggest that you use our weekly / daily "Trade Triangle" method when looking at futures, you may want to see two alerts for your January 09 Crude Oil. You could set "Daily Trade Triangles" and "Weekly Trade Triangles" so that you can look for new "entry or exit" signals or if you should be looking change your position direction. To learn more about our Alerts and how they work please use the link below to take you to our Help Section. If you have any questions please don't hesitate to call our Customer Service team at 1-800-538-7424 or shoot them a message at support@ino.com. This is a great video. I think there should be more videos explaining how we can set stop loss and create trading plan using Trade Triangles. I joined on a trial basis and I was able to understand how one can get in the trade using this wonderful technology but there is no mention of how one can manage his/her trade while they are in the trade. I think there should be more videos explaining how to setup broker accounts and introduction videos for different markets in an elementary level for the users who are very green in this game. I will love to see following videos on your blog. 1. Introduction videos on trading different market and dos and don'ts within those markets. What to look for in brokers. And how contracts & margins work in those markets. 2. How to manage trade when we get in the trade using Trade Triangle technology. How to use stop loss and money management while being in the trade. How to take profit. .
3. A private forum for users to interact with each other and share their ideas if it is possible for the company. I would like to thank you for your comment. I think that your suggestions are great and I will make sure that we try to get these as topics or videos on the blog very soon. We appreciate the constructive comment and welcome them with open arms. Thanks again and keep visiting as I'm sure we can accommodate your request in the near future. I trialed your system for a month but decided not to continue because, though the trades you show are fabulous, how does one find them? Do you have an advisory service? I'm sorry to hear that you didn't stick with us for longer than the 30-day period. How does one find trades using MarketClub? Since every trader has their own unique risk tolerance, trading goals, and trading plan... every trader's methodology will be different when selecting potential trades. Our Smart Scan can help look for symbols that have specific charting patterns. It can also help you choose symbols that have a specific volume or price. This will help you quickly weed the "wastes of time." From there you will be returned a list of symbols that fit the criteria you choose. You can add these to your portfolio and start tracking them. Truly I think it depends on what you are most comfortable with. We have various tools to help you find trades by Chart Analysis Score (calculation of short-term, intermediate and long-term trends), New "Trade Triangles" (these have recently had a change in trend) and Smart Scan (consider it a filter). After you find them... it's up to you to trade them with a consistent method. I would highly considering taking a deeper look at our MarketClub Help Section. Particularly the areas of Chart Analysis Score, Smart Scan, and Recent Trade Triangles.